As the seasons turn a new a leaf, the fashion world gears up for new releases and forecasts for trends. 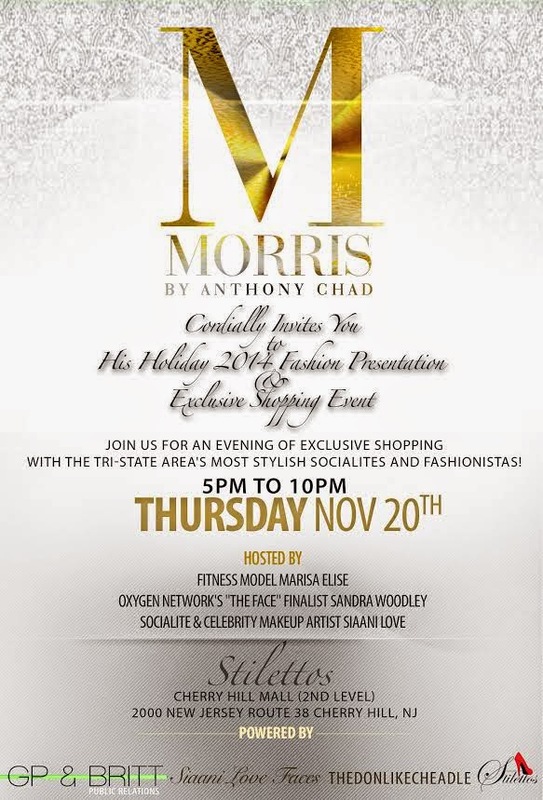 On November 20th, celebrity stylist and designer Anthony Chad will unveil his 2014 Holiday Collection for his women’s ready-to-wear line MORRIS. The presentation and exclusive shopping event will be held at Stilettos located in the Cherry Hill Mall on the second level from 5 to 10 PM. Fitness model Marisa Elise, Oxygen Network’s “The Face” finalist Sandra Woodley, and celebrity makeup artist Siaani Love will all host the event as guests get to shop and view the newest collection by MORRIS. Guests will be treated to an evening of live mannequins, fine wine, hors d’oeuvre, music, and special surprise guests. Confirmed special guests include Bleu Bombshell’s editor-in-chief Tanyka Renee. The new holiday collection serves as an accumulation of Chad’s past six months of hard work. “I’ve been working really hard to really hone in on a specific market of girls: the ‘it girl’,” Chad explains. His holiday collection is an assortment of trendy must-have pieces ranging from textiles of lace all the way to spandex and argyle. He crafted pieces like midis and crop tops all the way to maxis and dresses. Each piece is custom-made to measurement for each customer. All the pieces fit the profile of the “it girl” that jet sets to LA on a whim or the “it girl” that prefers lattes to coffee. Overall, the “it girl” appreciation was Chad’s effort at targeting trendy girls across the globe who have a fashion forward attitude towards living. Chad hopes to extend the collection further post-event, hoping to dive into trendy “it girl” shoes and accessories. Dressing for the up-to-the-minute is not new for Anthony Chad. Anthony's past celebrity clients include Trey Songz, Rosa Acosta, Charli Baltimore, Claudette Ortiz, Kendra G., Lisa Rinna, and many more. His styling work has been featured by major outlets such as Vogue Italia, MTV, MTV 2, MTV UK, BET, Fashion Bomb Daily, Maxim, New York Times, Daily Mail, GQ, and more. To stay up-to-date with Anthony Chad and the MORRIS line be sure to follow him on Twitter and Instagram @anthonychadstyles and @morrisbyanthonychad. Be sure to check out www.morrisbyanthonychad.com! And most importantly, don’t forget to stop in Stilettos Cherry Hill Mall on November 20th to stock up on the newest holiday collection!